The relocation of Marriott’s headquarters to downtown Bethesda would bring new riders and revenue to Metro, without straining Metro’s capacity. A win-win! Marriott last month announced it will move its headquarters to downtown Bethesda, bringing over 3,500 employees to a location that’s now accessible to the Red Line. The move will help Metro by attracting more riders and fare revenue to the Red Line. Using our S.W.A.R.M. model, we estimate that the new headquarters will bring about 1,200 new boardings/day on Metrorail, and over $1 million per year in new fare revenue. What’s more, we’ve already got space for these new riders. 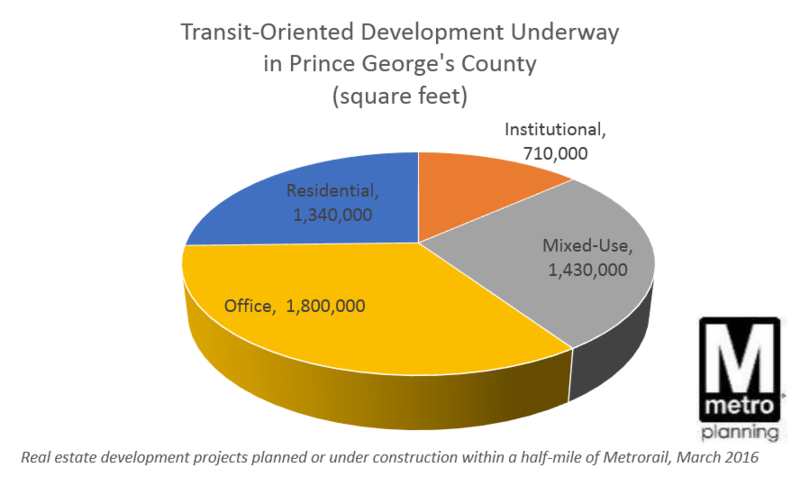 Since most of the new riders would be reverse-commuters (towards Bethesda in the morning) or would originate in Montgomery County, they would not strain existing crowding on-board trains at our pinch points, a.k.a. our maximum load points. Bethesda station has sufficient vertical circulation capacity for them as well. In short, this move is a win-win for Metro, the riders, and our funding partners, and we applaud the decision. 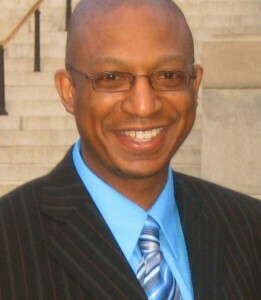 In this guest post, Mr. Christiaan Blake, Director, WMATA Office of ADA Policy and Planning describes a new cost-cutting partnership called Abilities-Ride. On September 30, the Washington Metropolitan Area Transit Authority (WMATA) issued a request for proposals (RFP) for its new Abilities-Ride program. 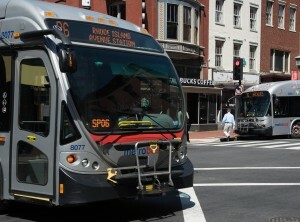 Abilities-Ride is designed to provide MetroAccess–eligible customers with access to a general trip purpose alternative in the Prince George’s and Montgomery County sections of the MetroAccess service area. Depending on the results of the program, Abilities-Ride could be expanded to cover the entirety of the MetroAccess service area. Abilities-Ride will not be a Metro service, but instead a public-private partnership between Metro and one or more vendors that provide existing or soon-to-be established generally available on-demand service. Metro will subsidize up to $15 per eligible customer trip. Surges 3 and 4 saw the highest shuttle bus ridership of SafeTrack so far. Overall, Metrobus shuttles moved around 17,000 trips per day during Surge 3, and around 25,000 trips per day during Surge 4. With shuttles every 2.5 minutes and Metroway running every 6 minutes, there were about 35 buses per hour during peak periods on Route 1. Taken together, the two services moved about 31,000 passengers per day during Surge 4. As a comparison, that stretch of road serves about 41,000 cars per day. A small portion of shuttle bus ridership was on the Franconia to Pentagon shuttle, with the remainder on shuttles between Pentagon City, Braddock Road, Crystal City, and National Airport. The sheer volume of ridership on the shuttle buses made the shuttle operation Metro’s busiest bus line, albeit temporarily. 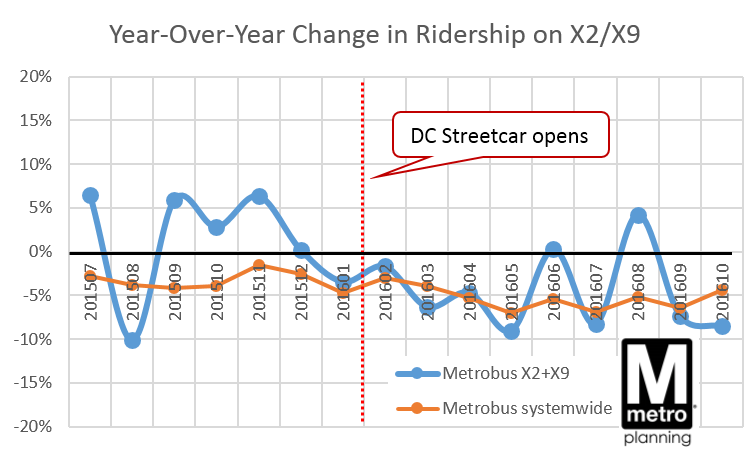 At 25,000 trips per day, the shuttles moved more riders than we typically move on any other major bus route, including some of the busiest like 16th Street NW, or the various 30’s buses. Not all rail customers chose to use the shuttles. Some riders, especially those traveling locally, switched to other bus routes. Ridership on the Metroway premium bus service more than doubled compared to June, and during Surge 4, it nearly tripled compared to the same period last year! Ridership on the 10A was up 29-64%, and 11Y ridership was up 128-133%, or more than double. Metrobus added service on all of these alternative lines, and Metroway did not charge fares during the Surges. We will be monitoring future ridership to see if any customers decide to remain with Metroway after the surges end. Overall bus ridership on other lines in the Surge area was up 1%. These first SafeTrack surges highlight one of bus’ key attributes as a mode: flexibility. The planning and scheduling team has worked out which routes the buses should take, which bus bays they should use at the stations, what time the buses need to leave the garages, and more. Our customer facilities team has ensured there were signs up at all the stops and stations pointing the way to bus service. The bus maintenance team has kept all the buses for SafeTrack up and running. The street operations staff have answered passengers’ questions and worked with the Bus Operations Communications Center and the bus operators to make sure everything ran smoothly. Bus operators have learned new routes in a very short amount of time and safely taken tens of thousands of passengers where they needed to go. Usually, Metrobus makes service changes only about once a quarter, since passengers count on the consistency and reliability of our service. But when it’s needed, bus service can be very nimble, allowing it to support the important maintenance work being done during SafeTrack. Did you ride Metroway or the shuttles during Surge 3 or 4? What did you think? What other opportunities are there to capitalize on the flexibility of bus service? If you are great with data and love cities and transit, we have a job for you. We were excited to announce that a job listing for a Business Intelligence Analyst position within Planning’s Applied Planning Intelligence unit has just been posted. We are looking for a healthy overlap between a data scientist and a transit nerd. For the full job description, head over to the wmata.com/careers site, scroll down and click on View all jobs. A short description is posted below. The shuttle buses at Eastern Market during Surge 2 are arriving every two minutes at rush hour, and are moving nearly the same number of people as 3 lanes of Pennsylvania Avenue SE. This shows how much we can achieve by giving buses priority – lanes, signal priority, and more – on busy streets. Shuttle buses are delivering 1,800 people per hour to Eastern Market between 8:00 and 9:00am. This is about the same as the number of vehicles that 3 lanes of Pennsylvania Ave. SE typically moves (1,500-2,000 vehicles per hour per direction, according to TPB Regional Transportation Data Clearinghouse). On Sunday, June 26, service changes will take effect on Metrobus routes across the region. These adjustments aim to improve system reliability, route simplicity, and customer service. The bulk of this service change impacts bus routes in Virginia. Check below to see if your routes will be affected and look up upcoming timetables here. Now that Metrorail closes at midnight on weekends, what buses are available? New regional bus maps can help you find alternatives to Metrorail after midnight. Since the launch of the SafeTrack program, rush-hour alternatives have been a hot topic across the region, especially for commuters impacted by the rail surges. However, it’s also important to address navigation strategies for people impacted by Metrorail’s earlier weekend closing time — midnight rather than 3:00 A.M. on Friday and Saturday nights (technically early Saturday and Sunday mornings). While nightlife patrons are part of the mix, most of our late-night rail customers are traveling to or from work. Since teleworking may not always be an option for these commuters, night owls should be aware of the bus options available after midnight. 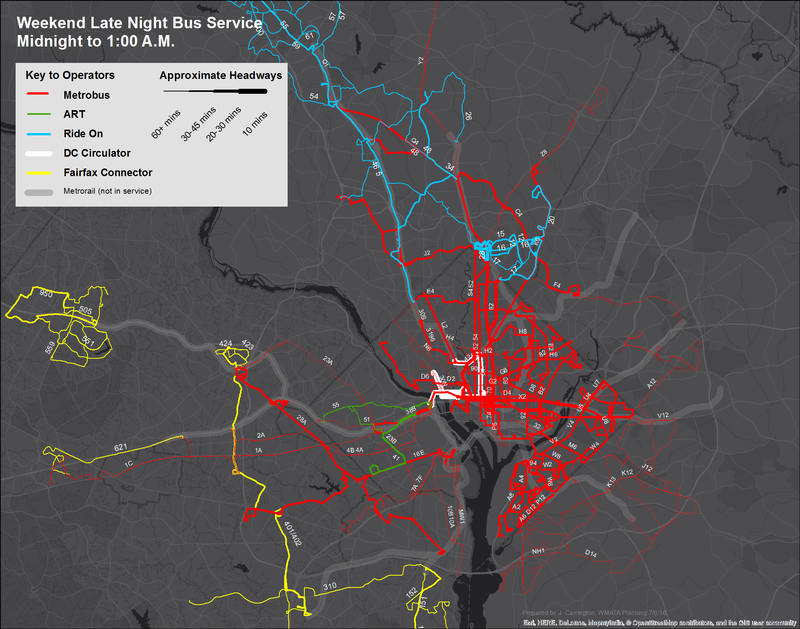 We’ve assembled bus service availability, by hour, on weekends from Metrobus and our regional partners, and put the data on maps! 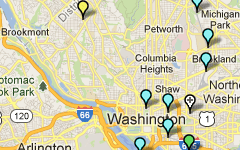 To see individual route labels, click on a map to expand. Detailed timetable information is available from Metrobus, Fairfax Connector, Ride On, ART, and DC Circulator. Some bus service differs slightly between the two weekend days; you can plan a specific trip in Metro’s Trip Planner. 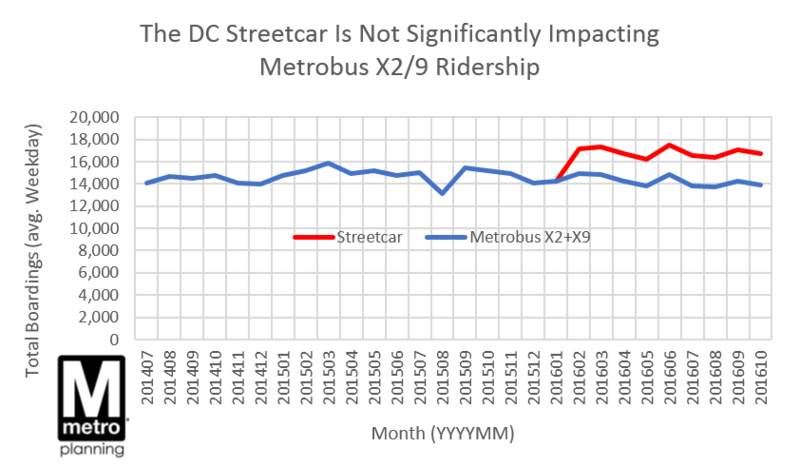 Note: Metrobus map data is based on information from the Late Night Service Study published in April 2016 and may not reflect recent service changes on certain bus routes. We will follow up next week with any updates. Updated 7/6/2016: Map graphics have been revised to reflect current service patterns. Biking near Buses: Watch Out for Blind Spots! Bus operators are trained to look for cyclists, but they can’t see you if you’re in their blind spot. Come see a bus’s blind spots for yourself at Fort Totten! Unless you’ve driven a bus (or large truck) yourself, it can be hard to get a feel for where the blind spots are in real life. This Bike to Work Day (May 20th), come see for yourself what bus operators can — and, more importantly, can’t — see on the road. Metro’s Fort Totten pit-stop will feature a live Metrobus demonstration with experienced Metrobus instructors. Hop in the driver’s seat (and who doesn’t want to experience that air cushioning! ), check the mirrors, and you’ll know where it’s safe to ride. While you’re there, brush up on your skills securing your bike on the bus’ bike rack. When buses and bikes share space on the road, visibility is the key to safety. Metrobus operators receive regular training on safety around bicyclists, but they need your help as well.